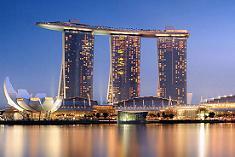 Five high-rollers have been sued by Marina Bay Sands (MBS). The Singapore-based casino resort has filed the case in order to recover $5.79 million US Dollars. It’s the largest group of casino whales that the casino operator has sued since it went open for business in 2010. Experts in the casino industry consider the alleged debts as relatively small in view of the fact that casinos record massive revenues. It appears that the Singapore-based resort wants to set an example by suing the debt-laden gamblers.